Allegory played a central part in traditional oil painting as it allowed artists to create imagery that was about reflecting their new upwardly mobile status from artisan to professional, after the ending of Middle Ages and into the Renaissance. 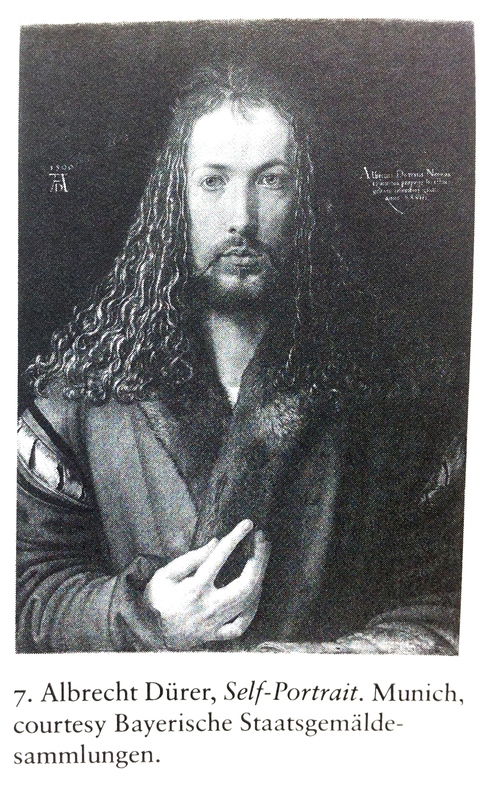 For example in his Self- Portrait 1500, Durer made an allusion to an almost divine status and solemnly modelled himself on the Vera Icon or true image. On the other hand Artemisia Gentileschi partly referred to Ripa’s iconography of the personification of the Allegory of painting ( based on the Ancient Greek goddess Athena ) and modelled herself on a revision of this particular representation. 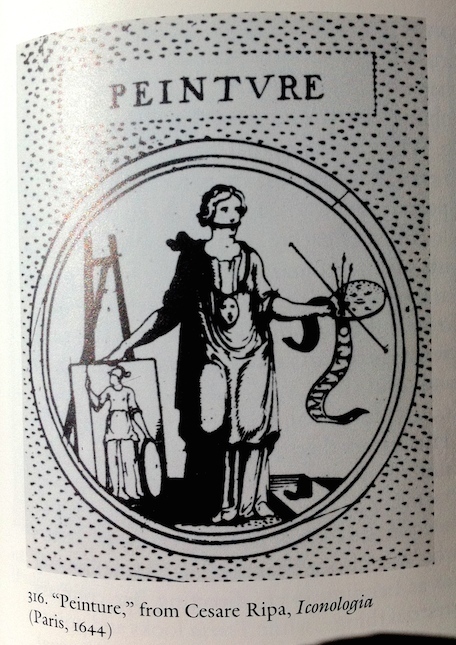 Her version showed a figure at work minus the gag that was an accompanying emblem of the allegory of painting figure. It alluded to painting as the silent art in comparison to poetry. The depiction of the head and highlighted brow and eyes referred to the state of vision and the idea of the rational, whereas the hands often referred to the senses and the irrational, as though the mind and body were split in two. 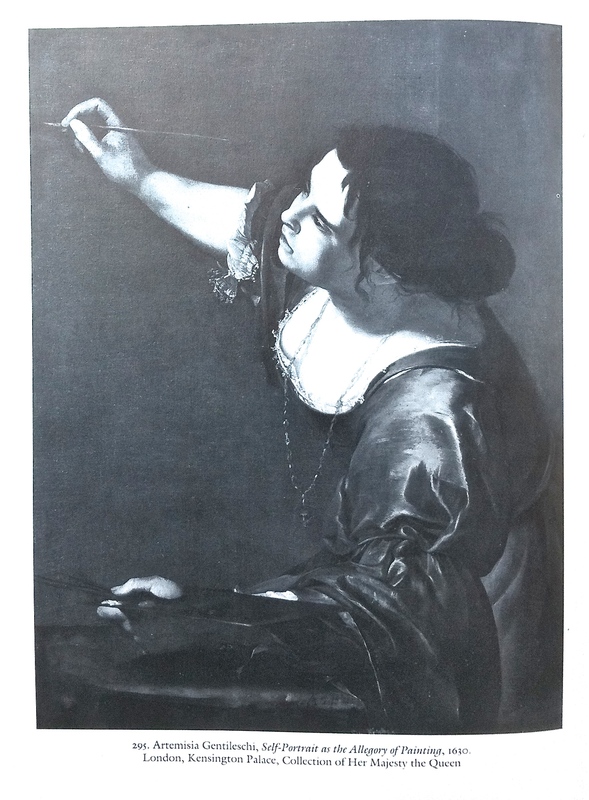 Artemisia Gentileschi in this painting titled Self-Portrait as the Allegory of Painting, 1630 appears to show how both mind and body interact. I have been influenced by her revisionist approach to establishment Baroque iconography because although it occurred centuries ago it still cast a long shadow into the 20th and 21st centuries in the ways that women are still represented and portrayed. I think I will call this series of small oil and mixed media works on paper The Selfie as an Allegory of Vision : Homage to Artemisia Gentileschi. I tried to depict aspects of different thought processes about identity, painting and place. For example the “Light is in the Blood” part of four titles refer to the complexity and interactions between sight, memory and action. For me its as though a mental image at the front of my mind flows somehow into my body in different stages that each require a double back into mental reflection, after and from which the flow of blood transports a random and often messy mental image into my hand and fingers. When I refer to places like “Karijini” and “Lake Mungo”apart from documentation, my depictions are about how I feel on a visceral level, as both part of the landscape and at the same time being mentally dwarfed by the appreciation of my place in time, walking on a living ancient planet. It is as though the landscape watches. The objects “mirror” and “window” refer to different ways of looking. We only see a mirror image of ourselves and not as others see us. Which memory of that image or selected aspect of it ends up on the canvas and during the memory transition what else enters this mental space; how much information from other sources can can I let in? The use of perspective in painting is sometimes referred to as if we are looking through a window but we are also apart of what it is that we look at. In the two paintings about the mobile phone I used its shape to resemble an ancient Minoan/Ariadnian column so that I combined references to ancient and modern imagery, reaching back and then reaching forward simultaneously as a way to avoid constructing stereotypical female imagery. The topic of self-portraiture is centuries old and representations often in a traditional style. I like to combine bits of ‘realism or naturalism’ with abstracted elements and gestural paint application as I have absorbed aspects of some 20th century “isms” and combine linear drawn mark making with areas of impasto, thin and thick paint layering and visual elements taken from several periods of art history. So much to choose from. Carol P. Christ is my source for the term “Ariadnian”. Categories: Drawings, Mixed Media, Oil Paintings | Tags: allegory, artwork, contemporary portrait, identity, self portrait, selfie | Permalink.